Commander Swiftstrike is often at the forefront of his troops. Here, armored in a Crisis Suit, he surveys the port city of Malati on the morning of his successful storming of the Imperial defensive line. Shash’el Tash’var Jax’nesh is commander of all military forces in the Sculptor System. Tash’var was born to the fire caste on T’au, the Tau home world, on 7 283 705.M41 (Imperial date). Trained since birth to serve the Greater Good as a warrior, Tash’var began his military career fighting the Arachens, a race of insectoids that rejected the Greater Good and engaged in a lengthy war with the Tau Empire before being driven out of Tau space. After passing his Trail By Fire, he was granted the privilege of piloting a Stealth Suit and eventually earned command of his own Stealth Suit Team. Over the years, he served in numerous campaigns, piloting a variety of battle suits, and finally earned command of a Hunter Cadre on the oxide deserts of Arkunasha, under the command of Shas’O Vior’la Shovah Kais Mont’y (now known as Commander Farsight). Tash’var distinguished himself at the Battle of Red Pillars, where repeated hit-and-run attacks by Hunter Cadre Crisis Suit teams destroyed a significantly larger ork force. Although seriously wounded—and hideously scarred—Tash’var was promoted to shas’el and awarded an honorary battle name: Commander Swiftstrike, reflecting his aggressive use of the Mont’ka doctrine of Tau warfare. 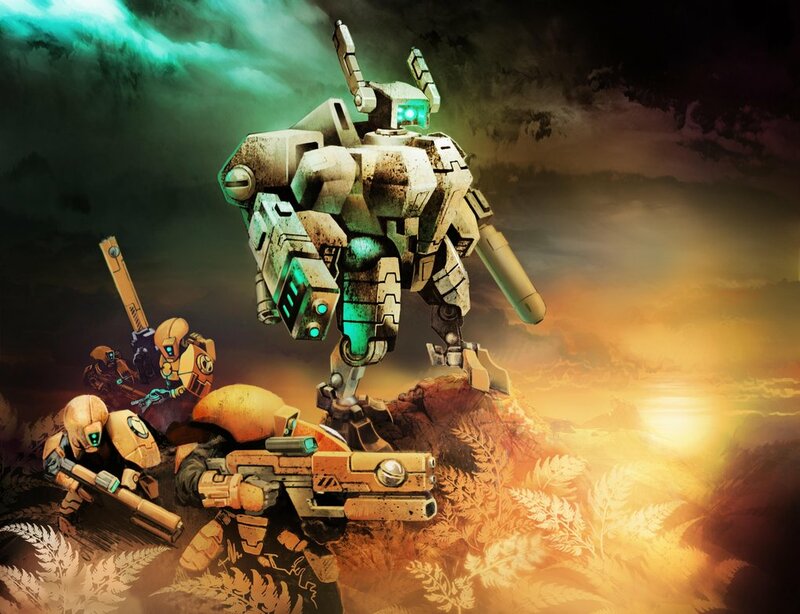 Although Tau forces in the region are almost exclusively occupied with the war on Arkunasha, the growing threat to the gue’vesa (human allies) in the Sculptor System could not be ignored. A small but growing military presence was deployed on the newest member of the Tau Empire, the planet known as Media III. Commander Swiftstrike was honored with command of this force. Now stranded on Dar Sai, Swiftstrike has decided that overthrowing the Imperial government—or at least threatening the Imperium’s hold on the moon—has the greatest potential for distracting Imperial forces from attacking the more populated Media III. Conquering Dar Sai, however, is a significant challenge. 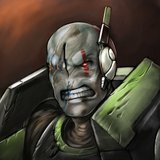 Until the Tau navy returns, reinforcements and supplies are limited, and Swiftstrike must husband his forces carefully. Still, only through military victory can he hope to convince the moon’s oppressed citizens that rebellion against the Imperium is feasible. The water caste insists, however, that only a few more victories will persuade enough humans to rise up. So far, Commander Swiftstrike has had moderate success in this difficult campaign. In mid-735.M41, his forces swept through the largely undefended western forests of Dar Sai’s main continent, although he was repulsed from his attack on the port city of Malati (First Battle of Malati). Commander Swiftstrike is a talented if aggressive leader who has shown great versatility, particularly as he wages war on Dar Sai. In essence, he is operating behind enemy lines, with limited resources, yet he has won a series of battles and greatly expanded his hold over the agricultural world. If not curbed, he may yet persuade the oppressed citizenry to join the Greater Good, leaving Imperial authorities with a disaster on their hands. To see more artwork by Johnny Graves (Skullsgunsandfire), click here. To see the artwork of Juan Diego Dianderas (0-Duredhel-0), click here. Great Post GM really interesting background story on the commander Swiftstrike. I wonder if you would ever run a battle from his early career against the Arachens. Could you use Starship Troopers bugs for them? Something different as you are using troops from two different game systems I know but still might be interesting and different.